I bought these very cute heart shaped molds a few months ago, and they had been placed in the cupboard where they stayed a while…. 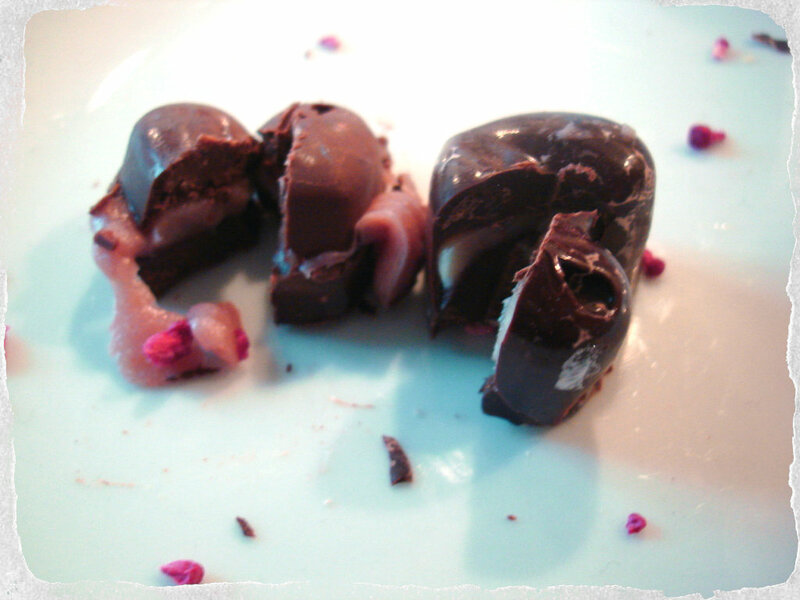 That is, until last weekend when I finally decided to give homemade filled chocolates a go. 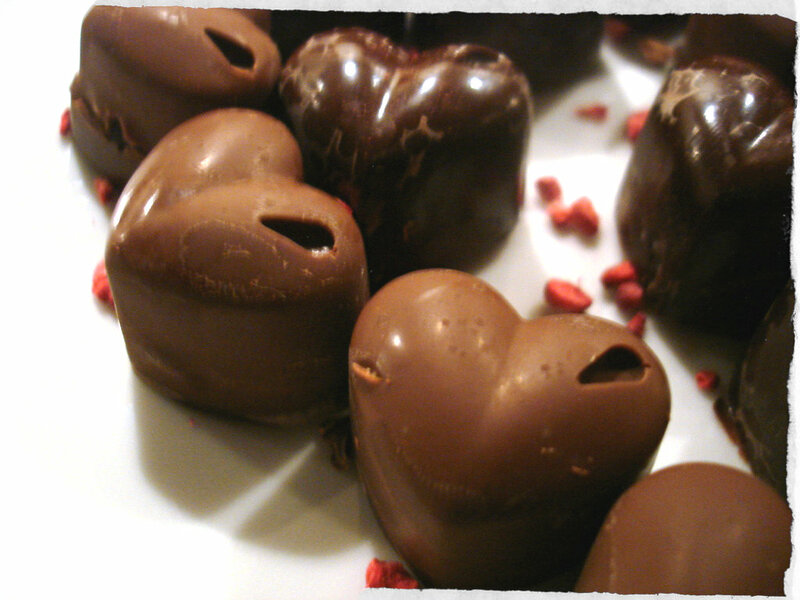 Who knew that making homemade chocolates isn’t that difficult? It did take a bit of time, concentration and a steady hand, but I had fun and they turned our pretty well, if I say so myself. Next time I’ll make them with caramel I think.. 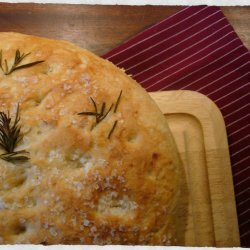 I used a recipe that I found on another great blog that I read regularly. In addition, you need molds. Mine are silicone and very easy to work with. I have two, each for 15 chocolates. 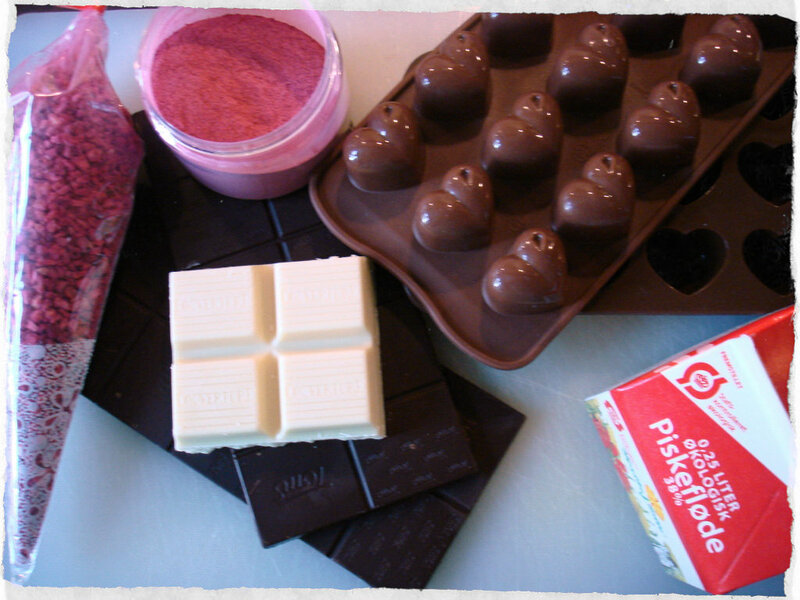 I have two molds and used one for dark chocolate and the other for milk chocolate. Melt 60 g of dark chocolate and 60 g of the milk chocolate. Fill approx. one teaspoon of melted chocolate in each “hole” in your chocolate mold. Turn the mold around a bit so the chocolate slides up the sides of each hole. If necessary, add more chocolate. Set the molds aside and let the chocolate set. Heat the cream – but making sure it does not boil. Stir the chopped white chocolate into the hot cream until it is melted and the mass is fine and uniform. 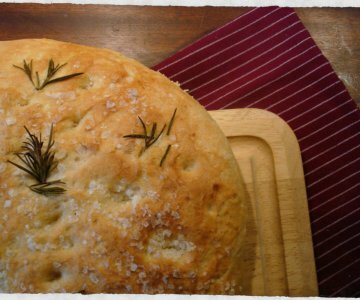 Set it aside and let it cool. When cooled, divide the ganache into two small bowls. 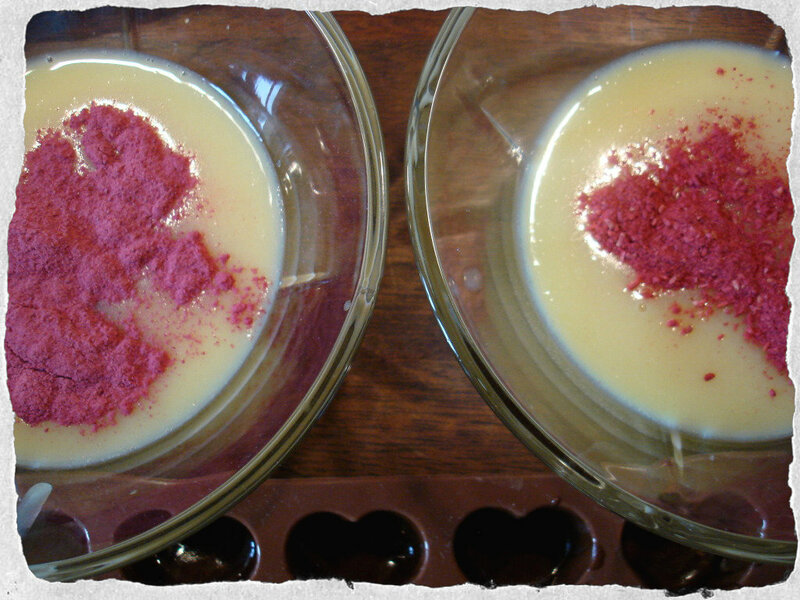 Now add freeze-dried raspberry and cherry in each glass and mix well. Start with approx. a small teaspoon of each, and add more if you like a stronger taste. The freeze-dried raspberries I bought weren’t in powder form, so I crushed it with my pestle and mortar, very quick and easy. Now fill the white chocolate ganache into chocolate molds. I chose to have cherry with the dark chocolate and raspberry with the milk chocolate. Do not fill all the way to the edge – leave a few millimeters of space for the chocolate lid. 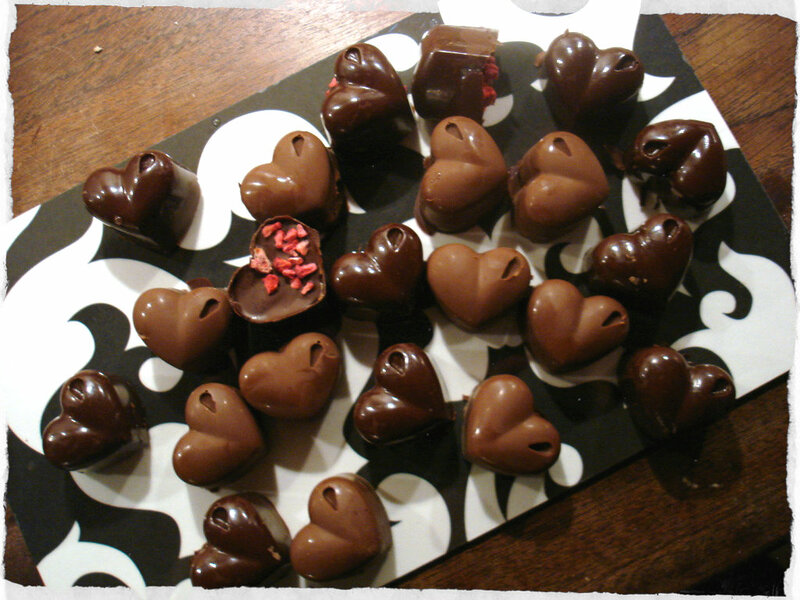 Lastly melt the remaining dark and milk chocolate and place on the filled chocolates as a lid. 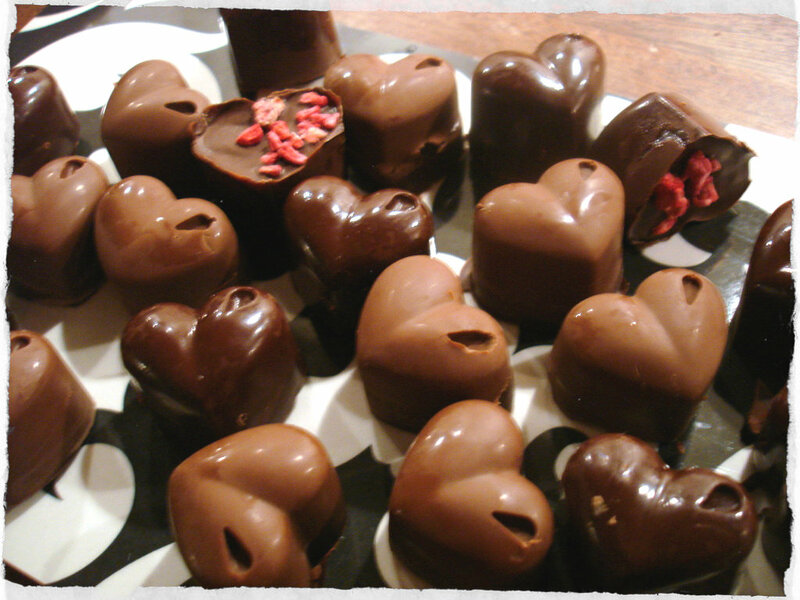 Now you just have to be patient and let the chocolates harden before turning them out of the molds. Be careful not to use too much force as they are a bit fragile.